Blogs have become a part of every tech marketers day-to-day tasks. They are used as a part of the marketing plan to bring in new leads, as well as keep existing ones interested. So, keeping up with posting blogs regularly is crucial to their effectiveness. A common goal is to post at least three blogs a week. But what do you do with older blogs? Do they get forgotten? Bury them under the new ones? Are they too outdated and should be removed? Any content you’ve created is important no matter how old. It just needs a little facelift. That way they grow with your company and the content you provide to leads. Historical optimization is a term coined by HubSpot and involves updating older blogs (3 months old and on) on your site to bring them up-to-date and rank higher in search results. This technique can be used on any older blog because they already have had traffic to the post. People are still visiting these blogs because they can still be found in the search query, updating them just bumps them to the top again. This way the organic traffic can be more easily generated once they are updated. The purpose of optimizing an old post is to bring it to page one in a search query. Blogs you have that fall under page two or three in a search are ones that will need updating. This strategy is part of the whole that can bring more SEO success to your content without having to always start from the beginning. Since the launch of inbound marketing, lots of companies have jumped on board with blogging on their websites. It’s great that we all want to get our ideas and information out there, but it has created a clutter of information. Some of the topics you’re thinking about writing could already be a build off of an older blog. So, instead of adding to the information overload, why not work with what you already have? Historical optimization will also help you get ahead of your competition. While they continue to generate new blogs and battle similar blogs for traffic, you’ll be building off a search people are already finding by bumping back to the top and bringing a new point of view to a topic that people are still looking for answers to. This technique is successful because it portrays that you have something different to offer from all the other blogs on the search page. 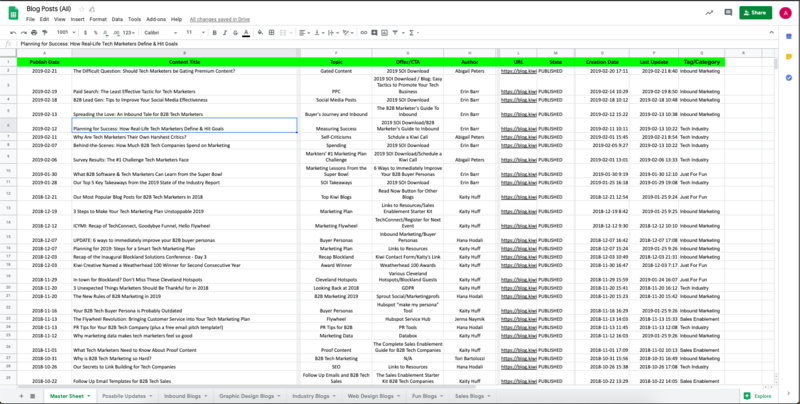 You’re probably thinking, “this is a great idea but where do I start?” Well, here at Kiwi we started by collecting all of our blog reports and putting them into an excel document. We use HubSpot to write, publish and track our blogs so we pulled our reports from there. Which exports it to an excel file or CVS. From there, it will give you a publish date, blog title, author, page views, click through averages, click through rate, and so on. Consider breaking your blogs into categories of topics to find a topic relevant to yours easier. Even adding a page where you isolate the blogs you found could use an update helps narrow the decision more. With all of that at your fingertips, you can go through which older blogs were successful and drill down into the topic more. It could give you ideas to build off of what you already have. To keep all of your updates organized you can even create a content calendar. It will help you plan which updated blogs to post and when during your content campaign it fits best. Once you’ve found the blog to update, don’t forget to add editor’s notes that there has been new information added. Even in the meta description and at the end of the blog with a date when it was updated. The readers will remember the blog from what they learned before and want to learn about any changes that could give them the answers they’re looking for. Historical Optimization may not be needed for every older blog you have, so finding ones that will be successful is crucial. Optimizing historical blogs will bring more people to your page because people are already looking for this information. But instead of it being on the second (or even third) page, the blog will be a top result. Take advantage of what you already have and reap the benefits. Looking for more tips on how to maximize your blogging efforts? 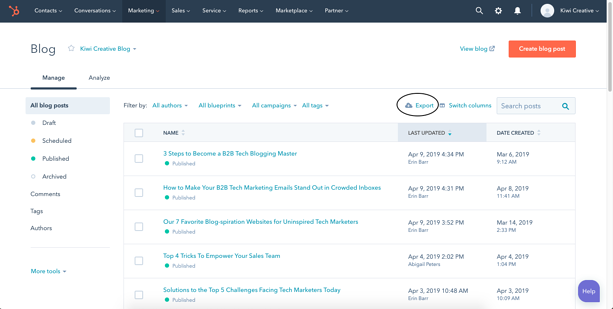 Check out Our 7 Favorite Blog-spiration Websites for Uninspired Tech Marketers or 3 Steps to Become a B2B Tech Blogging Master.